Kamcev, Mijalkov, Tarculovski, Jovanovski, Nikolov, Davitkovski, Kostovski, Gusterov, Azmanov – names of politicians, businessmen, current and former, are entered in church founding charters throughout Macedonia as financiers for the construction of religious buildings. The church urges today’s businessmen to register as church founders, following the example of former grandees and dukes to preserve orthodoxy. They say businessmen in Russia are major builders – church founders and donors and the people contribute to interior design. 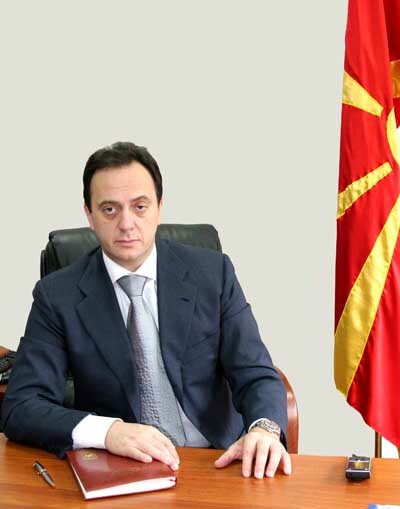 “They should join with sincere intention and desire, and not think they would be justified and redeemed for sins, but to do so with the love of faith”, explains for Inbox 7 the chief of the Cabinet of the MOC-OA head g. g. Stefan, Boban Mitevski. Some want to be anonymous, some are carved in frescoes in the churches and rarely disclose the amounts spent. Religious communities and MOC – OA and ICM respect their anonymity, but the event of consecration is public in presence of many guests, often including ministers and mayors. 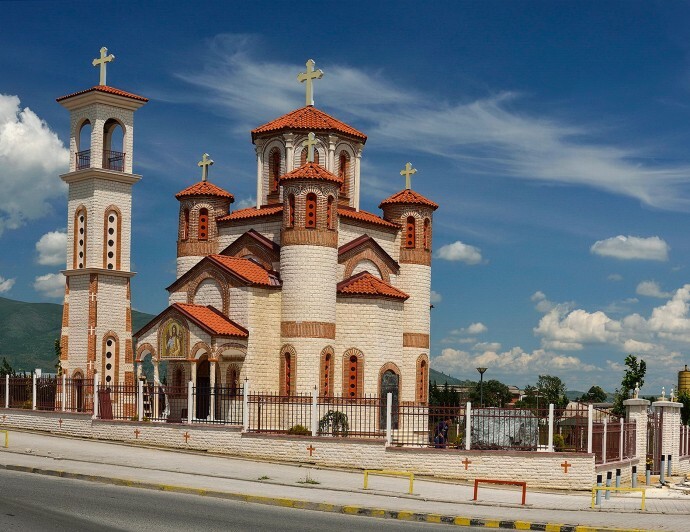 The Skopje settlement Aerodrom where until recently there was only one church Sv.Ilija, today has a few Orthodox churches – Sv. Nikola, Sv. Stefan, Sv. Bogorodica, Sv. Petka, Sv. Sofija, Sv. Jovan, Sv. Trojca. From Skopje diocese they reveal that there is a plan to build a new church right opposite the train station. From the municipality of Aerodrom they claim that the MOC-OA request was approved at the Council and that construction can begin. Other religious buildings received approval from the previous council. They point out that if a certain facility is found to be of general interest for the community, it may be exempted from payment of utility fees. Such is the example of the new church, where parking space was exempted of these charges. An interesting fact is that small churches-chapels throughout the municipality, as well as the cross which is built versus Dzevair Holding Company skyscrapers, have the status of temporary facilities or are treated as kiosks and summer terraces. Several chapels have already been built in Aerodrom: “Sv. Nikola“, which is part of the square complex “Jane Sandanski” in Novo Lisice and the church under construction on the boulevard “Serbia”, opposite the skyscrapers, which will be named “Sveta Petka“. Although citizens of this settlement complain that they need new kindergartens or social facilities for the poor, the expansion of the construction of orthodox churches does not stop. Earlier this week, the foundations of Sv. Trojca were consecrated, whose founder is the Russian businessman Sergei Samsonenko, owner of the football and men’s and women’s handball club “Vardar”. The foundations were consecrated on Monday (09.06.2014), and the church will be built in Russian style. 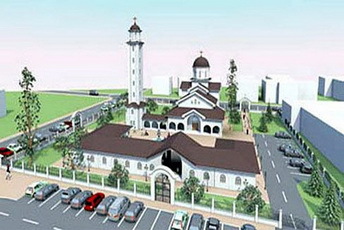 Samsonenko said he was pleased that this church in Russian style will be located next to the sports center and the hotel “Russia”. Today (14.06.2014) is the consecration of Sv. Jovan Krstitel, which is being built in the park with the plane in Novo Lisice, municipality Aerodrom, donated by the construction company Adora Engineering under church founding of Prof. Dr. Ivan Chifliganec. The temple is a five-domed church, which was built for two years, it is 16 meters high, with 18.5 meters bell tower. There is a fountain with mosaic and park. “Everything my parents and I have achieved in life has been with God’s help” said for Inbox 7 Vanco Chifliganec, owner of Adora Engineering, who after the consecration of the church immediately organized his daughter’s wedding in the afternoon. He reveals that they had no trouble getting the location of the temple by the Municipality of Aerodrom. On the contrary, he says that it was there where he was told that this location has a special characteristic that is located next to the river Vardar or, as Chifliganec says, the Macedonian Jordan. Adora Engineering is a major investor of elite buildings with about 1,000 apartments and a modern shopping center in Aerodrom. Vanco Chifliganec, who has made a real boom in the construction business in Macedonia, last year ended with a profit of 10 million Euros. 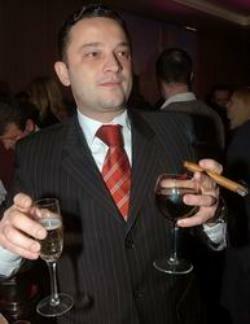 He earned his first money as ex – CEO of the mining giant from Radovis, Buchim. He was an MP and Professor at the Faculty of Mining. Then, church founder of Sv. Sofija which is built in Novo Lisice is Saso Davitkovski – the head of “Skopje market” (SP). 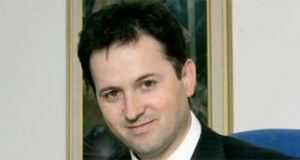 TheDavitkovski family owns the largest number of shares in SP. According to the latest data from the Central Securities Depository, the Davitkovski together hold 28.36 per cent stake in the company, worth, according to the current average market price, almost 2 million Euros. Under the umbrella of the SP company are the biggest markets in Skopje and the Davitkovski have chain stores SP, Maxi D markets, and the cosmetics store Unique located downtown opposite the Gate Macedonia. Another church in the settlement Aerodrom, that is the facade and bell tower of Sv. 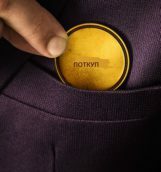 Stefan at Majcin Dom will be arranged by the tycoon Zoran Azmanov, whose name was connected with the affair about the sale of the hotel “Izgrev”, property of MOC. 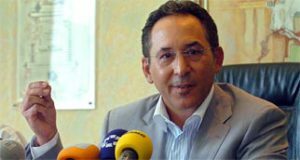 Controversial businessman Zoran Azmanov is the owner of the construction company NASTEL which has been building in Skopje and throughout the country for a decade and is undoubtedly one of our wealthiest citizens. Followed by scandals and affairs, he claims that the competition raises uproar, but he works duly and legally. 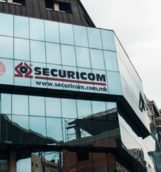 The construction company “Zikol”, which is building two other churches in eastern Macedonia, is also the church founder of “Sv. Nikola”, in Upper Lisiche, on whose suggestion it is named by Saint Nicholas. Strumica, which is a contractor of the church Sv. Trojca, built in Russian style near the hall Jane Sandanski in Aerodrom. Apart from projects across the country, it has built a residential complex in the settlement Aerodrom. The list of churches and monasteries that have received support from Zikol, as stated on their website, includes dozens – Sv. Jovan Krstitel, churches Sv. Gjorgjija and Sv. Ilija in Aerodrom, then churches in Kocani, Turnovo, Raborci etc., as well as the security wall of the residential complex of the MOC with Christianity applications. Church founding carries certain rights and obligations, each church founder, donor or contributor, above all has to be a believer. The desire to donate to the church most often takes businessmen and officials to their roots, they donate in their birthplace. 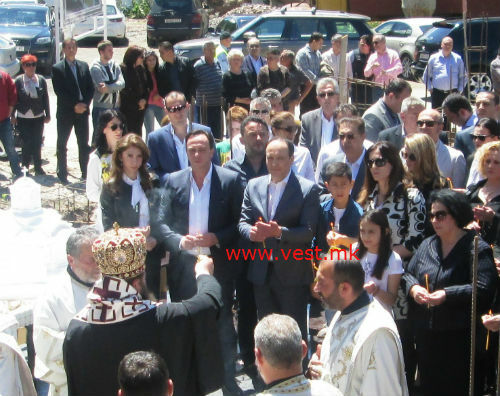 Families of the Director of SIA Saso Mijalkov and businessman Orce Kamcev are church founders of “Sv. Macenik Dimitrij Solunski” in Novo Selo, Stip, on the site of the former maple across the bridge that leads to the warm waters L’dzi. Contractor is the construction company “Beton” from Stip. 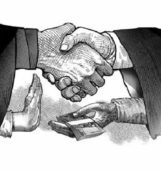 Saso Mijalkov – the wealth of the head of SIA and first cousin of the Prime Minister Nikola Gruevski, according to the questionnaire submitted to the Anti-Corruption Commission, weighs about 2.7 million Euros. His name is associated with firms in the Czech Republic. Orce Kamcev – he began getting rich at the time of privatization of Macedonia sport chain stores, owned by his father. He is co-owner in the hospital Acibadem Sistina, owner of Stopanska Bank Bitola, ZIK Pelagonija Bitola, co-owner of Lozar-Pelisterka, Beton Stip, MPM Macedonia through which he owns the newspapers Dnevnik, Utrinski Vesnik, Vest, Tea Moderna, GTA, farm Eurolend former Skopje Dairy, the restaurant Sushiko and many other companies. Through ZIK Pelagonija he got an opportunity to manage 10,000 hectares of exclusively fertile soil in Pelagonija. His wealth is now estimated at more than 20 million Euros. Besides Kamcev and Mijalkov, Johan Tarculovski also went back to his roots, and in the church “Sv. Nikola” in the Skopje village Ljubanci he has donated a bell tower. In the tower a bell weighing one tone will be built, which is kept in the village, said bishop Agatangel at the consecration. “This is a great joy for all of us, for Ljubanci village where I was born, for the church “Sv. Nikola” where I was baptized, where my parents were married. I grew up here as a child and it has always been my honor and pleasure all together to raise our church to a higher level and make the life in the village Christian, yet richer and happier”, said Tarculovski after the act of consecration of the foundation, attended by the mayors of the City of Skopje and Municipality of Butel, Koce Trajanovski and Petre Latinovski. Johan Tarculovski – he worked in the Ministry of Interior and as a security to President Boris Trajkovski. He is a former Hague prisoner, convicted of war crimes during the 2001 conflict in Macedonia, spent eight years in prison in Scheveningen. In March last year he was welcomed as a hero. Due to the close ties with VMRO – DPMNE when he was still in prison his wife Sonja Tarchulovska was hired in public administration, i.e. government. 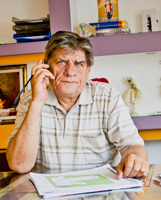 He owns an apartment in Skopje settlement Kisela Voda, and has a house in his native Ljubanci. Mite Jovanovski, owner of Makoil is church founder of Sv. Jovan Krstitel, which is being built in Skopje settlement Butel. So far he has spent 200,000 Euros, say church circles. The church is being built on the site of the handball playground of the former club “Butel” and will cover 500 square meters and its highest part will be 25 meters. Support facilities for baptism are going to be built, too. Mite Jovanovski – known as Mite Makoil owns petrol stations “Makoil”, as well as hotels, restaurants and services for technical inspection and servicing of vehicles. He weighs several million Euros. To the question of Inbox 7 whether donations by businessmen and politicians mark a trend or they do it for self-promotion, Archbishop G.G. Stephen replied that he hoped that this trend will continue. “It is current some to build temples, we are happy that it really happens in the church. Nevertheless, it is not enough just to have means. You need to have faith and love, to love Orthodoxy. I hope this trend will continue, because this generation, which has bearers of God in them, respect the faith and live by faith, and God rewarded them with an opportunity to earn, I hope the honorable way”, said in a statement for Inbox 7, the Archbishop of Ohrid and Macedonia, g.g. Stefan. 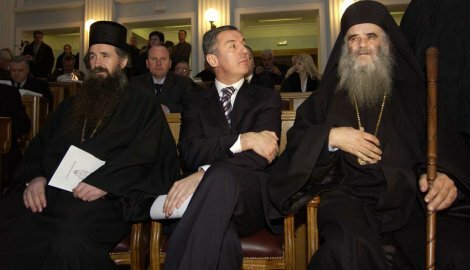 The head of MOC-OA, Archbishop Stefan pointed out that Trifun Kostovski is one of the biggest supporters of the church, then Saso Davitkovski, Mite Jovanovski etc. The list of donations by Trifun Kostovski is long, ranging from churches, monasteries, iconostasis across the state to donation to repair the Millennium Cross at Vodno. For restoration of St. Bogorodica in Skopje he allocated 1,000,000 Euros and is one of the biggest donors for the MOC. Recently he financial helped rebuilding the monastic quarters in the monastery Sv. Jovan Bigorski. “There are no special reasons for the decisions of restoration of Sv. Bogorodica and the building of monastic quarters in Sv. Jovan Bigorski, as well as many other donors aimed at reconstruction and construction of new churches. I am deeply convinced that it is due to the moral and ethical norms in my personality from early childhood. Tradition as part of our overall life is strongly embedded in me and trusting it, I feel this is my job. They were not pre-planned, but occurred in need or to meet certain goals that are important to our lives. Why in Christian churches? Because they are part of my heritage. Why donating in Muslim temples? Because it is a cultural heritage of the people with whom I share space, time and life”, says Trifun Kostovski for Inbox 7. As he says, these large projects are due to the financial power which in those times would allow bigger ventures and “in no time have I doubted that whatever I start, I will finish”. “I would not like to talk about the amounts, as it is neither in the spirit of Christianity, nor in the spirit of my upbringing. The material is ephemeral, spiritual remains forever”, says Kostovski. He believes that the goals of donations are universal and huge and the space is very wide, donors can choose the areas for which they think the aid is necessary or desirable. 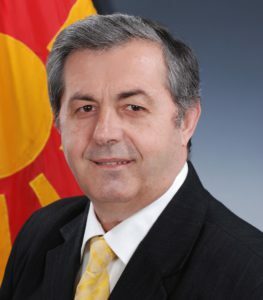 Trifun Kostovski – former mayor of Skopje is a major donor with several million Euros donated in sport and in churches. His businesses across Europe are linked to trade with metals, banking and insurance companies. He is known as the owner of Kometal Trade, Postal and Euro Standard Banks, Euro Link Insurance. Once he was manager of FC Rabotnicki, FC Vardar and the handball club Gjorce Petrov where he donated millions of Euros. He still weighs several million Euros. 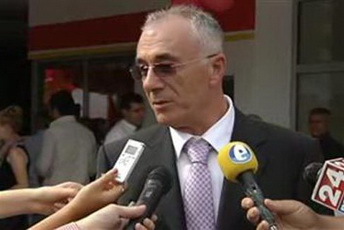 Trifun Kostovski has his own SGI organization which conducts political analyses and organizes conferences and debates. Metropolitan of Debar and Kicevo Timotej in conversation with Inbox 7 says that in his diocese there are no church founders of large-scale. “Donations in the sense of contributions are given and the profile of the people is from the poorest to the richest. The church has always depended on the middle class. But the richest give the least. Plaosnik was constructed with public money. 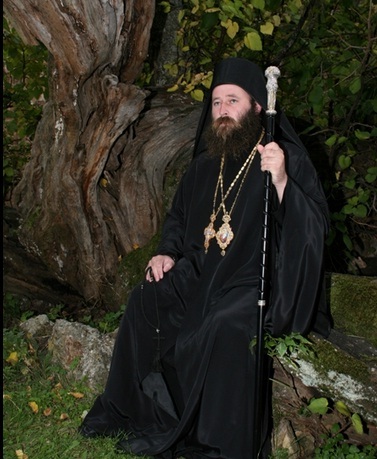 However, to be a church founder means to take from your own pocket”, said for Inbox 7 the Metropolitan of Debar and Kicevo and Plaoshnik g.Timotej. Bitola – Metropolitan of Pelagonija Petar pointed out that in Bitola a church founder of Sv. Atanasij Veliki is the Gerzovski family, who own the gas station “Torpedo”. 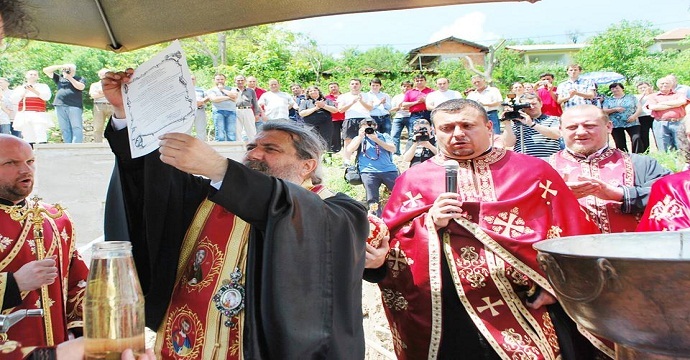 He pointed the example in Stenje, Prespa, where group of donors, a few businessmen from Prilep are financing the construction of the local church. 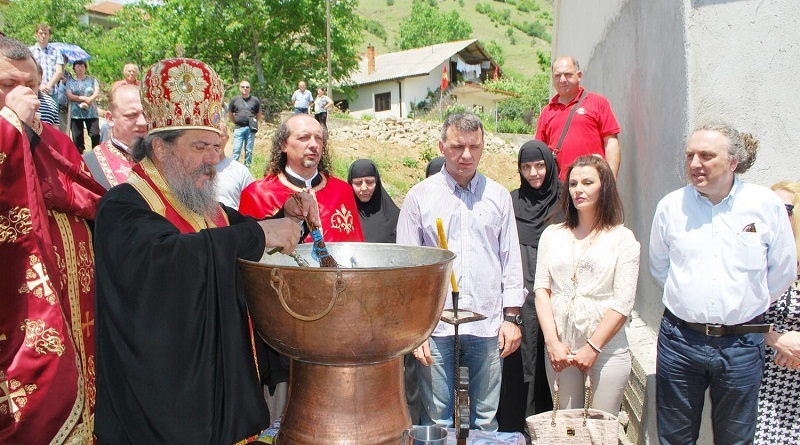 “Vladimir Ralev, Swiss businessman, has donated $30,000 to build nine temples in Mala Prespa”, said bishop Petar. European Metropolitan Pimen points out that in his diocese there are many helpers, but as he said, they are not complete church founders. The biggest donors of the church Sv. Petka that is being built in Kavadarci are the firms “Feni Industry” and “Kozuvcanka”, that is director Konstantinos Daskalis and the owner Mitko Jancev, and along with bishop Agatangel they consecrated the foundations four years ago. As informed from the Povardarie Diocese, the former mayor of Veles, Ace Kocevski, who once financially helped the temple Ss. Cyril and Methodius, is now building a church in his native village. The current mayors of Valandovo and Demir Kapija are helping the rebuilding of churches in their towns. “Church founding is a phenomenon linked with cultural and civilization rise of humanity. It was usually associated with rulers and demonstrating the power. Starting from building polytheist temples to today’s, churches, mosques, synagogues and other names according to the nature of religion. It is affiliated with religious needs, but also the possibility of eternalizing someone’s own name because the object may repeatedly to go beyond the life of the founder. He will be mentioned in each opportunity, or the object will be named by his name. The construction of religious buildings is connected with the rulers and their closest”, explains for Inbox 7 Dr. Cane Mojanoski, full-time professor at the Faculty of Security and former head of the Commission for Inter-religious communities. “Tax exemptions are considered a serious boost to charities and church founding activities. 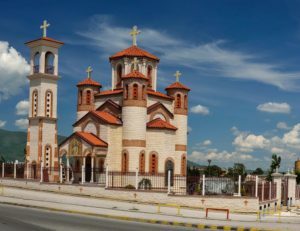 Even today in some developed countries, especially overseas, there is a policy of tax exemption for investments in religious buildings”, said Mojanovski. He points out that in Macedonia there are numerous examples when people from one religion help building a temple of another. “The basic problem is not church founding, but whether there is a rule how budget funds are invested in religious buildings. The question that should be asked is whether and how taxpayers’ money is diversified in religious buildings? Here, in this country, there are no rules. Religious communities are separate from the state. However, in open sessions, the Government decides on investments in religious communities or facilities. Does it have rules? For example, can Orthodox believers in Oktisi expect money from the state to rebuild the local church? Can Muslims in Prilep expect money from the state to rebuild the mosque? As there are no rules, each single solution can be seen as practice. Therefore Islamic religious community thinks it is disadvantaged, as Orthodox believers believe that the response of the authorities in places where Muslims predominate is not appropriate. That is fueling the sense of inequality. When we add the fact that the religious leaders in the communication act as political leaders (full of themselves, do not talk, measure who and how is inclined to them), then the situation gets a cold relationship”, says Mojanoski. “It is dangerous if the religious feelings become an element of political struggle. Then it is the end of inter-religious coexistence and tolerance. 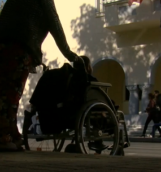 When there is a sense of inequality, all sorts of situations are possible”, says Mojanovski asked if such development could disturb inter-religious relations. Professor Mojanovski points out that just because of that the government is responsible to establish order and rules. It is not understandable for a multi-confessional environment not to allow the believers to renew or build a religious facility. Everyone suffers from lack of rules, but it is mostly felt by small religious communities. “Unregulated relationship and “partisan behavior” of the authorities could lead to disruption of inter-religious relations”, said Mojanoski. A church founder is a person who appears as a builder, patron of the church temple or monastery, explains for Inbox 7 theologian Aleksandar Ivanovski. “The word “ktitor” is a Greek word that means – holds in power, or acquires. The root of church founding right should be sought in the first century when the Roman state did not acknowledge Christian right to existence, and the Church had no right of ownership, then dynasties appeared which built monasteries and churches and which gave some property to the Church. They claimed the ownership of such property and such owners were called “ktitors””, said Ivanovski. “Church founders had more rights than church successors, statutory law enabled them to issue rules for the organization of the church and the life in the monastery. This rule is called Typikon, church founders carried typikons of monasteries, however they had to comply with church canons. In the institution there had to be a book called chrysobulls and every donor had to be written in it. Administrative law of the church founder consisted in that he could suggest bishops, abbots and members of the clergy in his monastery, although these proposals could be turned down by the bishop. Church founders also had a RITUAL law, i.e. were entitled to an honorable place in the monastery or temple, their name was mentioned in religious services, their frescoes were painted”, explained theologian Ivanovski for Inbox 7. The name of the church founder is mentioned during the part of the liturgy where holy communion is prepared in the altar. In the entrance to the temple a mural of the donor is drawn on the left. Once criticism from church circles for reflection of non-canonical side of the church Sv.Trojca in Radovish was aimed at one of the greatest church founders Risto Gusterov. 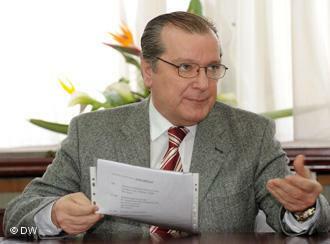 Risto Gusterov – businessman who came from the company Techno Metal Vardar, acquired his wealth in trade with metals. Later he invested in the U.S., more precisely in Florida, mostly in real estate and hotels and restaurants. He weighs more than ten million Euros. All of the abovementioned names of politicians and businessmen have entered the so-called church founding charter, a copy of which is buried in the foundation, one is stored in the competent eparchy and one is given to the church founder. A year ago Bishop Hilarion suspended two founders on the grounds that they illegally and non-canonically got rich at the expense of the believers. A person called Dalibor in the church “Sv. Trojca” in the Stip settlement Babi arbitrarily administered and did not comply with the Constitution of the MOC, and intended to privatize the church. According to archbishop Hilarion, same was the situation in the church “Sv. Petka” in Stip village Kaluzlija, where self-appointed founder built quarters and frescoes without any approval of the diocese and gave no account for funds donated by Orthodox believers. The Metropolitan of the Bregalnicka diocese announced that there will be proceedings against these two cases. Recently on the founder’s mural in the cathedral “Resurrection of Christ” in Podgorica citizens recognized the character of Montenegrin Prime Minister Milo Djukanovic. The media broadcasted the statement by the priest of the church, Velibor Dzomic, who said that some people in the face of the mural recognized Djukanovic and others do not. It is understandable because despite their sacredness, murals also have artistic expression, said Dzhomic. In Macedonia, the owner of the chain of pharmacies Zegin, Blagoj Mehadzhinski and his family are on a mural in a pharmacy in TC Leptokarija.